Police image of the ATM skimming device. The skimming device was one of two finds made in Lurgan and Banbridge today (Saturday, July 7). Posting on the Craigavon PSNI Facebook page an officer said: “Folks we've had two reports, one from Lurgan, one from Banbridge in the last hour, of a pair of males with an ATM skimming device. In Banbridge, a female had her card snatched from her along with a device taken off the machine by the suspects. “The males are described as white, possibly eastern European, one wearing a white t-shirt, the other a red t-shirt. 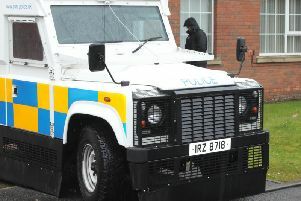 “In Lurgan, the device pictured was found on an ATM. It's a card trap, and you can see from the bottom pic how hard it is to detect. “Excercise caution when using any ATM, keeping an eye out for similar devices. If you have any concerns, or you feel you're being watched, don't attempt to use the machine but phone us immediately. “If you have any information about these incidents, or see males matching that description is suspicious circumstances, call us straight away. The incident number is 618 of today, 07/07/18.